When I started working at Korin, I was amazed at how much there was to know about knives. I was offered to be taught how to sharpen knives by Mr. Sugai, and I said yes immediately. 2. 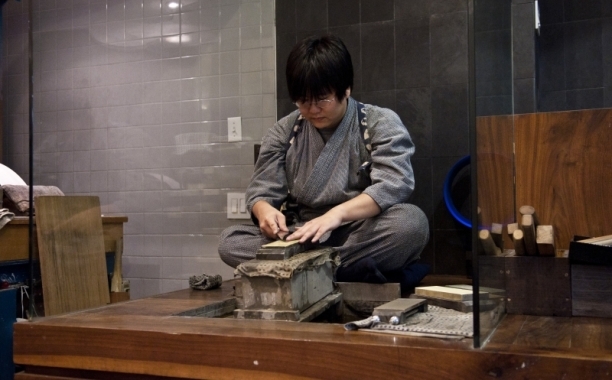 Do you feel knife sharpening on traditional whetstones is a dying art? Yes. Even in Japan, not many people know how to properly sharpen a knife. The art of sharpening is not being passed on to the next generation as it was years ago. Because this knowledge isn't being shared, there are not as many people who understand the importance of knife quality and the different types of sharpening stones. Not all sharpening stones stand equal. Although there is a standard quality, because these stones are technically man-made in a kiln like pottery, there is bound to be a few that are a much better in quality than others. For example, the quality between stones that are baked in the middle of the kiln and the stones baked during different seasons are all going to be completely different. Therefore, you will never meet the same quality stone twice. 3. Do you think people undervalue the importance of a sharp knife? I feel that many people have not experienced using a truly sharp knife. A brand new knife is not at its sharpest and most people are not aware that knives do not come 100% sharpened out of the box. 4. What is the difference between traditional Japanese knives vs. Western chef knives. The main difference is that a traditional Japanese knife is a single bevel knife which allows it to be much sharper. A sharp blade slices through ingredients effortlessly, whereas a dull blade will damage the cell walls of the ingredient, altering the texture and flavor. For example, if one tries to chiffonade basil with a dull knife, the basil will turn black almost instantly. With a thin sharp knife, the same chiffonade will retain its vibrant green color for hours, or even days. The single-edged blade is a unique feature of traditional Japanese knives, which is directly linked to Japanese cuisine and history. Traditional Japanese cuisine aims to preserve and accentuate the true flavors of fresh and seasonal ingredients, making a sharp knife essential to this process. Western-style knives have a blade edge that is sharpened on both sides. This edge style is commonly referred to as a double-edged blade. It is a stronger blade configuration than the single-edged blades of traditional Japanese knives, and Western-style knives are perfectly suited for any kitchen. The Westerns knives Korin carries are different from most Western style knives found in the US marketplace. The majority of Western knives on the market today have a 50:50, or symmetrical “V”-shaped blade that is sharpened the same way on both sides. Although the 50:50 edge is convenient to re-sharpen, Korin's Japanese Western-style knives are sharpened to a thinner, asymmetrical edge. By concentrating the sharpening on the face of the blade at a steeper angle than on the back side, a thin cutting edge is created that approaches the sharpness of the traditional single-edged Japanese design.These uneven beveled edges are made possible by innovations in steel-making, tempering, and edge crafting employed by Japanese manufacturers. Lower grades of steel would not hold this angled edge design and would soon dull. In addition, a blade formed with less flexibility would chip or crack when sharpened. 5. What should someone look for when buying a high-end Japanese knife? Make sure the knife is straight, find out how the knife was forged, and ask what type of steel the blade is crafted from. There are a variety of levels when it comes to traditional Japanese knives, therefore you want to make sure you find the best knife for you. For beginners, we generally recommend kasumi style knives. Craftsmen forge kasumi knives by joining a piece of soft iron with a piece of carbon steel. After forging, hammering, and shaping, the carbon steel becomes the blade’s edge. The soft iron portion becomes the body and spine of the blade. This reduces brittleness and makes sharpening easier. Kasumi knives are much easier to use and sharpen, but their edge retention is shorter. Hongasumi knives are high-grade kasumi knives. They are often made of higher quality materials where special attention is paid and more steps are involved in the forging, tempering, and finishing processes. Damascus layered steel is becoming increasingly popular due to its added benefits and attractive appearance. To create these blades, high carbon steel is layered with soft iron then forged and hammered. Among the kasumi knives, layered steel blades have the longest edge retention. Honyaki (or "true-forged") knives are constructed entirely out of one material. Honyaki knives have the greatest kirenaga, or edge retention within Japanese knives. However, because the steel is so hard, honyaki knives are harder to sharpen and more prone to chipping, cracking, or breaking if used improperly. Craftsmen require a great amount of skill to forge honyaki knives, and chefs need a lot of experience to use and care for them. 6. What are some basic tips on knife care and maintenance? When using any knife you want to make sure to keep it clean and keep it dry. Regardless of whether you are using a carbon knife that will discolor or a stain resistant knife, a good knife should not be left wet in a sink for hours. 7. As with Japanese food, Japanese knives are seeing an unprecedented surge in global popularity. Why do you think that is? Many Japanese knives are crafted with extreme care and precision. The craftsman who make these knives make them with the intent of making a tool that helps chefs connect with the ingredients they are cutting to create a beautiful dish. A single yanagi (fish slicer) knife requires at least four skilled craftsmen and two weeks to create. Even top knife companies can only produce knives at the rate of ten to twelve pieces per day. The knife making process is divided into four distinct stages: forging, blade making, handle crafting and assembling. A skilled craftsman puts the blade through many different steps before it is passed on to the next craftsman. The number of steps varies from knife to knife according to the shape of the blade, the type of materials used, as well as the finishing procedures required. A top-grade knife undergoes upwards of fifty different steps. 8. Korin offers left-handed knives. Is there really a difference? Left-handed knives will make a huge difference especially with traditional Japanese knives. 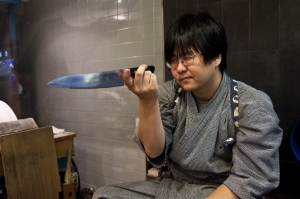 You would not be able to use a right-handed traditional Japanese knife if you are left-handed. Korin carries a few left-handed traditional Japanese knives, however in most cases customers special order them through us. 9. What's your favourite knife? I have a Togiharu Inox Chef 8.2" and love it. I use it everyday and it requires very minimal sharpening. It's ideal for home users and professionals in the kitchen because it's lightweight and holds its edge. 10. What's your favourite Japanese food? I love Japanese barbeque with hida beef, kobe beef, matsuzaka beef... Any BBQ that melts in your mouth! A special thanks to Korin and their master knife sharpener Vincent!